Mondays seem to be particularly busy for us so we count on the food we prepped over the weekend plus some easy adds to make dinner. And when in doubt, we seem to turn to pasta as an easy, cozy dinner. Tonight, the boys ate chicken parmigiana (made with the breaded chicken cooked yesterday) and spaghetti with tomato sauce (from the freezer)… pretty low maintenance as it goes to feed two hungry boys! Wanting something lighter, I turned to an old favorite… “Parslied” Pasta. 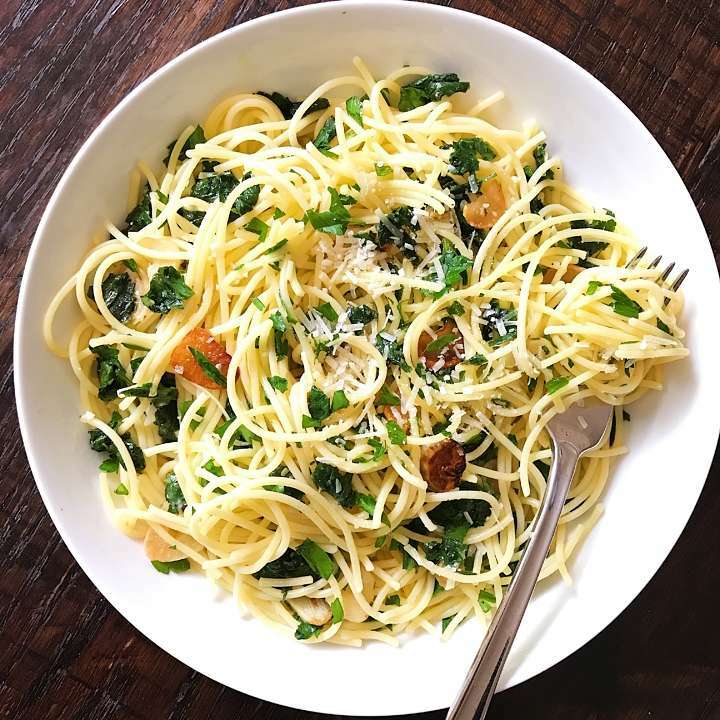 Recipe from Cooking Light, this is simply Gluten-free spaghetti tossed with fresh parsley, sautéed garlic, EVOO and Parmesan cheese. It literally takes no time and is an easy alternative to the classic tomato sauce the boys opted for.